Snoopy is an all time favorite Charles Schultz character from the Peanuts Gang. Even though Snoopy doesn’t talk per se, like all good pets, he has a lot to say and a lot to teach in his own special way. Listed below are a few of the lessons we can learn from this fearless pooch. We can have meaningful friendships with those unlike us – Snoopy teaches a lot about friendship through his relationship with Woodstock, the bird. One would never expect a dog and a bird to be such close companions, yet they are. Just because someone is different from you, doesn’t mean you can’t extend the right hand of friendship. Persistence pays off – Snoopy always had an ongoing fight in his imagination with the Red Baron. One of his biggest goals was to bring down the Baron. According to the song, “Snoopy and the Red Baron,” Snoopy was successful in the end. The lesson here is to stick with the program until you reach your goal. Use your imagination – If Snoopy has one major asset, it is probably his imagination. He does the most amazing things in his imagination. One lesson kids can learn from this is that you can truly be anyone you want to be and do anything you want to do if you use your imagination. Developing this skill opens up all sorts of possibilities down the road. Repurpose things – A dog’s ears are for listening to the sounds around him…unless you’re Snoopy; then, they’re used for a variety of things – including helicopter blades! Your kids can’t turn their ears to helicopter blades, but they can learn to think of new ways to use items around them. You’d be surprised at what your kids will come up with once they get the hang of repurposing. Be willing to try new things – Snoopy is always up to something. Whether it’s writing a novel, skateboarding, flying around on his dog house or cooking, he is always doing something new. Snoopy teaches us that we can learn to do all sorts of things; we just need to be willing to try. Be a great friend – A great friend is one who believes in you, and if you’re fortunate, that friend believes in you to the point where you begin to believe in yourself. Every one could use a friend like that. One of the best ways to have a great friend is to be a great friend. Happiness comes in all kinds of packages – As the song says, “Happiness is anything or anyone at all that’s loved by you.” Snoopy seems to find happiness in a variety of ways and he seldom seems down. Teaching kids to recognize happiness when it shows up, even in small ways, will encourage them to find the silver lining in any clouds that come their way. Keep a cheerful attitude – Snoopy seldom seems depressed. His cheerful attitude permeates everything he does. Helping children cultivate a cheerful attitude can lead to their lifelong success. Dr. Toshihiko Maruta of the Mayo Clinic says that optimists have a higher level of functioning both mentally and physically. Get enough rest – Snoopy snores atop his dog house in blissful sleep. Perhaps that’s the key to his sunny attitude. 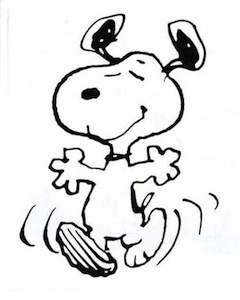 Do your happy dance – Snoopy loves to dance. Dancing is what he lives for and watching him do his happy dance brings a smile to your face. Nothing is cuter than a little kid doing a happy dance over some little treat. Maybe that’s a lesson that we can all learn – good things call for a happy dance. These are just a few things that kids can learn from one of the most famous dogs in the world. Use fresh eyes to look at the characters your child encounters and try to find the lessons that can enrich your child’s life.